The National Museum of Mathematics (MoMath) highlights the role of mathematics in illuminating the patterns and structures all around us. Its dynamic exhibits, gallery, and programs are designed to stimulate inquiry, spark curiosity, and reveal the wonders of mathematics. The Museum’s innovative exhibits will engage folks from 105 to 5 years old (and even younger!) Given its mission to change perceptions of mathematics, MoMath is especially valuable for 4th through 8th graders. See what people are saying about MoMath. The Museum is located at 11 East 26th Street in Manhattan and is open from 10:00 am to 5:00 pm, seven days a week, 364 days a year (MoMath is closed on Thanksgiving Day). Special note: MoMath closes early the first Wednesday of every month, at 2:30 pm. 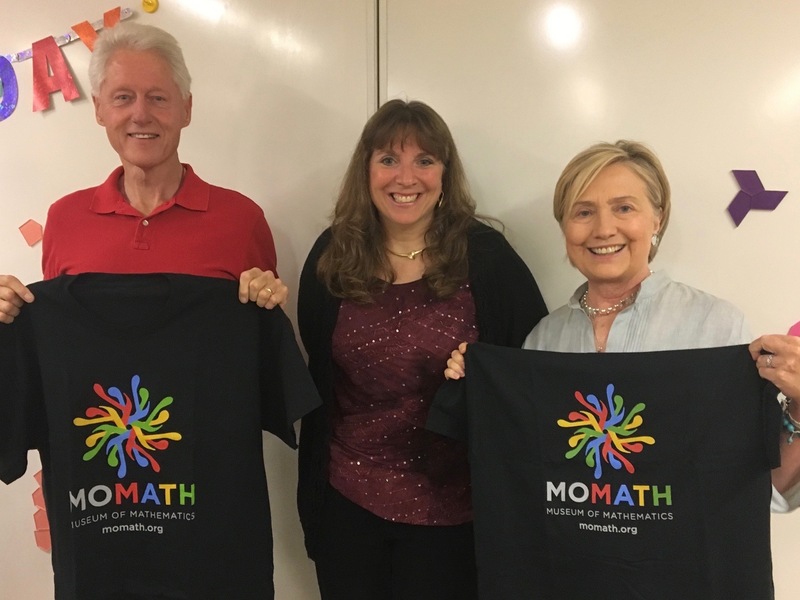 Executive Director Cindy Lawrence, are fans of MoMath! Take a tour with MoMath’s new Derivatives tour program, or join one of MoMath’s specially-trained educators in Explorations, a hands-on classroom experience to discover the wonder of mathematics. Don’t miss your chance to see math in a whole new light, only at MoMath. See what mathematicians think is beautiful about mathematics. Now featuring Stephen Wolfram! You’ve been recruited! MoMath and The Wall Street Journal are pleased to present Varsity Math, a weekly math challenge featuring two new puzzles a week. Bring your school, camp, or other group to MoMath this summer and experience one of MoMath’s hands-on, educator-led sessions! Registration for the 2017-2018 school year is open. Click here to learn more and book your field trips and group visits today. Host a one-of-a-kind party for your child (or yourself) at MoMath! FlipKey by TripAdvisor recommended MoMath as one of the country’s 50 most fascinating museums!